A sweeping historical novel set in Jamaica, Quebec, and Massachusetts over the course of fifty years and almost 600 pages. 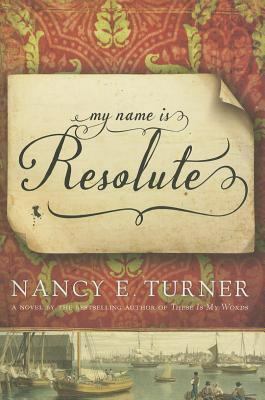 Resolute Talbot is only ten when her family’s plantation on Jamaica is attacked by pirates, and she is taken captive with some of her family. Her older sister and brother do whatever they have to for survival. In Colonial America, Resolute is made to work hard for a family who moves to the wilderness, where they encounter bears and Indians. The Indians take her to a convent/orphanage in Quebec, where she is called Marie and learns to spin and weave. Escaping with help as a teen, she settles in Massachusetts, where a suitor abandons her when he learns she won’t inherit the Jamaican plantation. Inheriting a shack and a farm near Lexington from an eccentric woman, Resolute always longs to be a lady and return to Jamaica, but instead marries a carpenter, spins and weaves, and aids the Sons of Liberty in their rebellion. With a long and colorful life highlighted by the occasional unexpected visits from relatives, Resolute is a memorable heroine. Though long, this novel really kept my interest with compelling writing and plenty of action. The author is best known for a novel about her great-grandmother set in the Arizona Territory, These Is My Words: The Diary of Sarah Agnes Prine. Readalikes include An Echo in the Bone by Diana Gabaldon and Someone Knows My Name by Lawrence Hill.